Have you ever missed curling up with a good book or piecing together jigsaw puzzles? 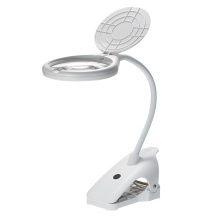 This desktop magnifier with lamp lets you get closer to your pastimes again. It can enlarge fine print in jewelry, maps, newspapers, directories, legal documents, coins, stamps and antiques etc. PRACTICAL& THOUGHTFUL: Adjustable LED lighting angle with 8pcs high bright LED light source, not affecting the irradiation point. BRIGHTNESS ADJUSTABLE & TWO DIFFERENT MAGNIFICATIONS: 2 kinds of adjustable brightness and 2 lens with different magnifications: 2.3X & 6X, meeting your different requirements in various occasions. CLAMP DESIGN AND FULLY-ADJUSTABLE: 95mm clip range makes it can be used efficiently and strong bendy tube enable you to swivel the lamp flexibly and adjust the light position as you need. WIDE USAGE: Excellent for those who need suitable lights for reading or studying, perfect tool for people who are involved in fine work such as coins, stamps, jewelry, embroideries and so on. ANTI-DUST COVER DESIGN: This magnifier&apos;s lens is designed with the anti-dust cap and frame, so that the lens can be not frayed and be used long time. EYE-PROTECTIVE: White color light, flicker-free and anti-glare light without strobes and radiation, it can keep your eyes away from exhaustion. APPLICATION AREA: Great magnifying tool for printing, machinery, carving, gardening, jewelry identification, collecting coins and stamps, etc. Range of Application: Printing, Machinery, Carving, Gardening, Jewelry Identification, Collecting Coins and Stamps, Viewing Flowers and Plants, Soldering or other Repairing Work, Reading, Drawing, Handicrafts, Textile, Watch Repairing, Table Lamp, Collecting, Antiques Appreciation, etc.